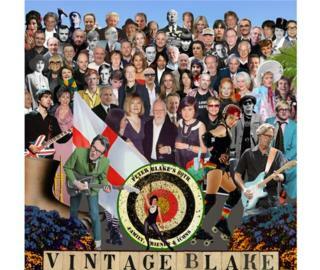 British artist Sir Peter Blake has recreated the iconic album sleeve for The Beatles' Sgt Pepper's Lonely Hearts Club Band on his 80th birthday. "It's a cross I bear, it's an albatross I have to deal with," he says. It is a fairly stark, somewhat surprising admission from Sir Peter Blake, sleeve designer of The Beatles' 1967 albumSgt Pepper's Lonely Hearts Club Band. "What vaguely depresses me still is that I'm known pretty much as 'Peter Blake - who did the cover of Sgt Pepper' when I've done so much else," he says. "Every so often I manage to forget it but it comes back all the time." What makes the revelation even more surprising is that Sir Peter has set aside any misgivings he has about his most famous work on the sleeve of arguably the Fab Four's greatest album, to create a new poster reimagining the image to mark both his 80th birthday and designer Wayne Hemingway's Vintage Festival. Gone are cutouts of actress Marilyn Monroe, comedians Lenny Bruce and WC Fields to be replaced by Amy Winehouse, Kate Moss, artists Tracey Emin and Damien Hirst and musicians Eric Clapton and Noel Gallagher. Sadly, gone too are The Beatles themselves. "I don't own the copyright," he explains. "Part of everything that went wrong at the time was that my agent signed away any kind of royalties and the copyright so we had to ask Apple Corps - The Beatles' management - for permission and they didn't want it to be associated with advertising." Apple Corps have yet to comment on Sir Peter's claims. Instead, Sir Peter has used what he called "family, friends and icons" on the latest poster. Though he has craftily managed to get round the Beatle-ban by including not one but three McCartneys. Longtime friend Sir Paul is in there, alongside designer daughter Stella and her sister, photographer Mary. Alongside the McCartneys are an array of faces - from food, represented by restaurateurs Chris Corbin and Jeremy King and chefs Delia Smith and Rick Stein, to Kate Moss and Paul Smith from fashion and Noel Gallagher, John Peel and Paul Weller for music. Late singer Amy Winehouse also gets a nod, Sir Peter fondly recalls his first memorable meeting with her. "It was after a South Bank Show lunch at the Savoy and we went into the American Bar after the lunch," he says. "We were thrown out because Jamie Cullum was playing the piano, Amy was singing and we were singing along around the piano and we got chucked out. I really liked her very much and admired her and was very sad at what happened. "It was memorable to be staggering out with Jamie and Amy," he adds. From the art world, sculptor Grayson Perry makes an appearance in full drag and contemporaries Emin and Hirst are present. Sir Peter is quick to defend Hirst from recent criticism, notablyby the critic Julian Spaldingwho questioned the artist's credentials. "I admire Damien enormously, I think he added a great deal to the excitement of the art world and I think that he is a very interesting artist," he says. "I think the mistake people make is that they think it's about him making money and it's not that. Money and wealth are often his subject and I think people mistake that for greed which again it isn't. "I honestly feel that if he suddenly didn't have any money, he'd be perfectly happy to stay in Devon and paint." Musician Noel Gallagher, who worked with Sir Peter on the Oasis greatest hits album, said he was "very chuffed" to be included in the new work. "I was lucky enough to go down to his studio," he told the BBC. "We were fans and all the props were still there from the Sgt Pepper photo shoot". Gallagher added that he had his photo taken with a waxwork of boxer Sonny Liston and "was as starstruck meeting the doll in the jumper that said, 'Welcome the Rolling Stones', as I was when I met Ringo." "If, for me, The Beatles and the Who and The Kinks and the Stones were the sound of the 60s then Sir Peter's work is the visual representation of that. "When I look at his pop art stuff, I hear the Beatles. He's as important as the music." The Vintage Festival which brings together fashion, music and art from the 1920s to the 80s is being held at the Boughton Estate in Northamptonshire on 13-15 July.